Elevate Se (2 lb. tub) (130 day supply for 1 horse). It is a Special Blend of Natural Vitamin E and Organic Selenium Yeast Made by Ky. Performance Products. It is designed to meet your horse’s individual needs. 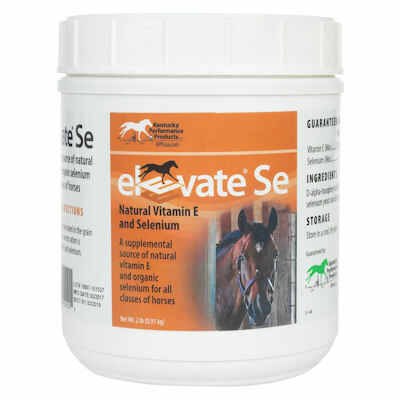 Elevate SE is formulated specifically for horses that require supplementation with highly bioavailable sources of both vitamin E and selenium. Research has shown that vitamin E is one of the most powerful antioxidants in the equine diet. But not all forms of the vitamin are created equally. Most supplements contain synthetic vitamin E (dl-alpha tocopherol acetate), which is not as potent as natural vitamin E (d-alpha tocopherol acetate). Compared to synthetic vitamin E, the body can more efficiently transport and deliver natural vitamin E to target tissues. Resent research in several species, including horses, shows that natural vitamin E is two to three times more potent than synthetic.